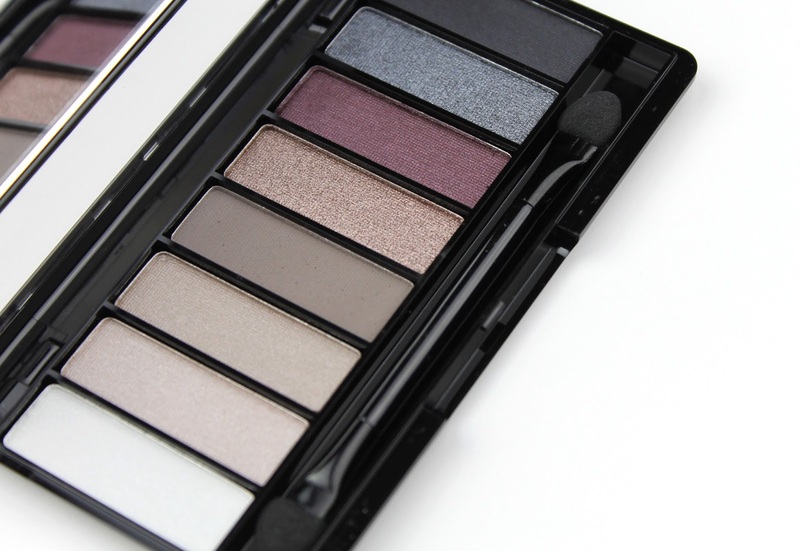 I recently received this palette for review and I have to be honest, I usually don't go in expecting too much from drugstore eye shadow palettes after being disappointed in the past, but I always hope. 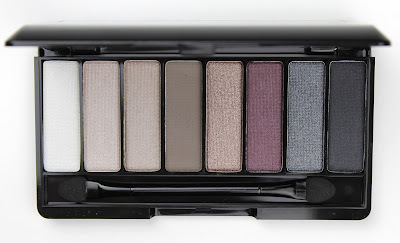 Thankfully, I was really pleasantly surprised by quite a few shadows in this palette and I think it is definitely worth the $19.95, especially if you can pick them up at one of the many Rimmel sales. 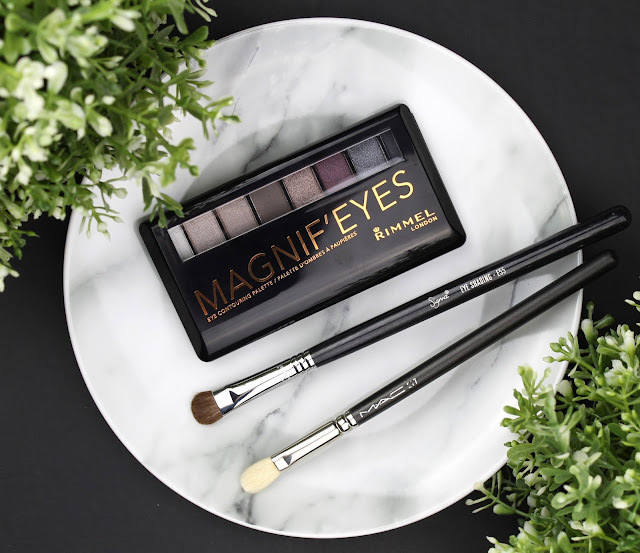 I have the Rimmel London Magnif'Eyes Eye Contouring Palette in 003 Grunge Glamour, which includes a lot of cool toned neutrals and a few grunge-inspired intense shimmers. It basically includes everything you need for a cooler toned smokey eye. This palette is also available in Keep Calm & Wear Gold with lots of gold and copper shades. I think that I am definitely going to have to pick up after trying the Grunge Glamour palette. Now this palette is pretty much exactly 50-50 for me. I love the four shades on the right but I am a bit meh about the four shades on the left. I find this is pretty consistent with drugstore shadows; they can pull of a great intense shimmer but the mattes and lighter shades often fall behind. 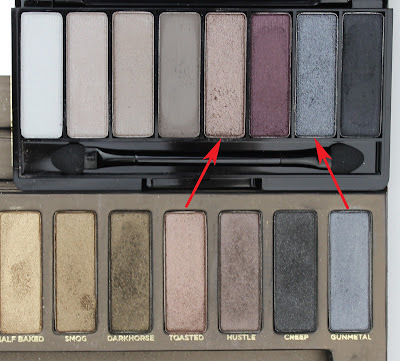 The matte taupe (fourth from left) is okay and gets the job done as a transition shade, which is really good because I hate having to go between palettes for an eye look. The swatches really speak for themselves and, as you can see, the four shades on the right are excellent. I find that matte blacks often swatch a little weird but rest assured that this one is pigmented and blends beautifully. I honestly think I would actually like this palette better as a pah-pow quad because the lighter four shades are quite average. They were very stiff and these really are heavy swatches. But don't focus on the negatives because that bronze! As soon as I saw this palette a few shades reminded me of the first Urban Decay Naked palette ($83) and I was totally right! The bronze is very similar to Urban Decay's Toasted, but I honestly like the slightly deeper Rimmel shade better. It is also worth noting that the quality comparison between these two shades are almost identical; they are both soft, buttery and intensely pigmented. 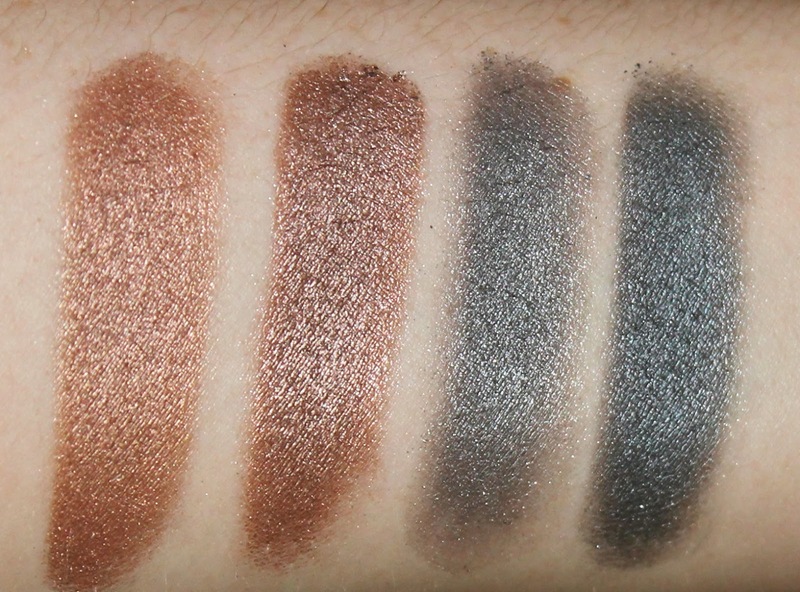 The pewter shade in the Rimmel palette is also a bit like Urban Decay's Gunmetal but the quality is actually better in the Rimmel one as you can see from the swatches. I was kind of blown away at how intensely pigmented it is. Left to right: Urban Decay Toasted, Rimmel Bronze, Urban Decay Gunmetal and Rimmel Pewter. The staying power is also really good on these shadows and they stayed intense and rich for a good 8 hours with no flaking or fallout. I don't have oily lids at all so I can't comment on their crease resistance because I've honestly never really had shadows crease on me. Here is a look I created with the matte taupe, bronze and plum shades and I really like it. It was actually really easy and didn't take much blending work at all. All in all, I think this palette is definitely worth it for those four shades on the right. Make sure you get it on sale too. The Chemist Warehouse has 50% off Rimmel twice a year and Priceline has regular sales too. I also like that this one has some slightly different colours that a lot of people might not already have in their standard neutral palettes. Drugstore shimmers have definitely come up a good few notches in some brands, including Rimmel; now they just have to sort out those lighter shades and mattes! Let me know if you will be picking this one up or if you already have because I would love to hear your thoughts. Disclaimer: This palette was gifted to me for review but my opinions are, as always, my own. 2 comments on "Rimmel Magnif'Eyes Eye Contouring Palette"
Haha I totally know that feeling! I have way too many too but they are just so pretty and tempting. Eyeshadow palettes are my kryptonite.